stamp the images on smooth white card stock. The butterflies I added for my scene are from the Newton’s Birdbath stamp set. color the image using Copic markers or any coloring medium of your choice. die-cut the image with the coordinating dies. die-cut the birch trees using the Forest Scene Builder dies and the grassy hill with the land border die. die-cut the rest of the elements needed to create the scene. ink up the background on Bristol smooth white card stock with distress oxide inks using the Sunscape stencil. Spray the background with water and dab it dry with a paper towel. assemble the card on an A2 size white card base. Finish the design by stamping the sentiment and add a pink heart. I would never trade in those times where my friends and I just enjoyed being kids, riding our bikes, playing games and not wanting to come home when it’s starting to get dark because of dinner. I am certainly thankful we didn’t have smart phones and computer games back then. Ink up some Bristol smooth white card stock using different pastel distress oxide inks with the Bokeh stencil set. Die-cut the flowers using the Flower Trio Die. Use a stamping mat and bone folder to shape the flowers and give it a little dimension. If you have a round stylus, it’s better. Ink up some Bristol smooth white card stock using distress oxide inks and the bold blooms stencil. Spray water and dab it dry with some paper towel. Use clear sequins as shaker element. die-cut the diagonal die coverplate and adhere acetate sheet. Add foam adhesive to create the shaker well and adhere on top of the background. adhere the flowers and leaves on the card and finish the design by adding the script sentiment die. Would you like to win the “Loads of Blooms” Stamp Set? This stamp set will be given away to ONE lucky winner! Comment on the NND blog and Design Team blogs (see list below)! The winner will be chosen at random from the collective reveal posts. 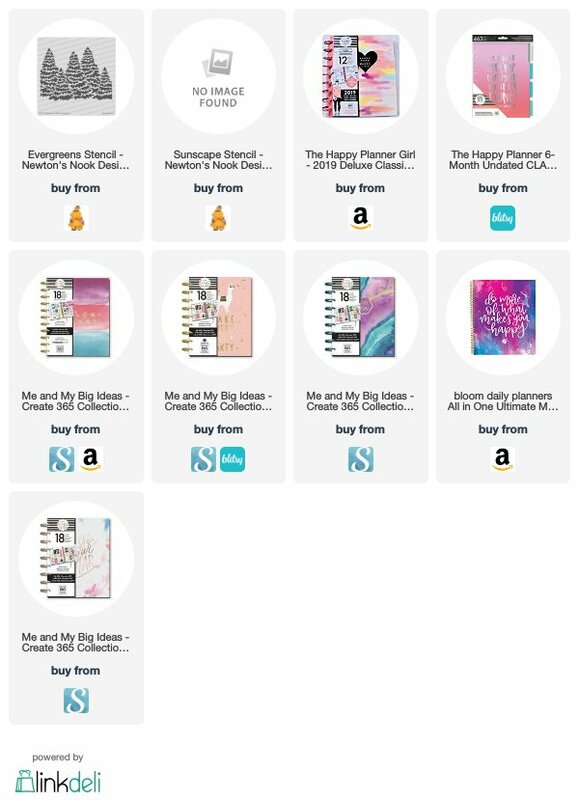 Make sure to check out each of their blogs and comment for your chance to win. You will not know which blog has been chosen so the more you comment on the better your chances are of winning! You have until Thursday February 14th at 9pm EST to comment — winners will be announced on the blog post on Friday, February 15th. Before I start, I just want to point out that some of the dies are a bit tricky to match up because they are similar in shape and size so Jennifer was kind enough to share this little sheet to help you to number them before you cut the dies apart. I love decorating my planner. I don’t always have time to do it each month but when I do, I go all out! I use stencils and distress oxide inks to add color to my pages. I also adhered some die-cuts, stickers and other cute elements just to make it cuter. For my first project, I stamped and colored the little kitties from the Newton Makes a Plan stamp set and colored them in with my Copic markers. Since these images are tiny, I tried to use a maximum of two markers to do my color-blending. I die-cut the little kitties with its coordinating dies. I stamped the words on the corresponding days from the It’s a Plan stamp set like “yoga” – which I do every Mondays, “shopping”, I do every Sundays and I leave mostly Tuesdays and Wednesdays to do my card-making and/or design team projects. I used the tiny heart checklist also from the It’s a Plan stamp set for my “goals”, “to do” and “my mantra”. I did not fill it all out just yet because I have yet to determine what goals I would like to set for myself this month. To decorate my planner a little further, I used the little kitties for my yoga days, the one inside the laundry basket for my laundry days on Saturdays, the Kitty holding a present for my husband’s birthday this month and the kitty holding a shopping cart for my grocery shopping day. Would you like to win the “Newton Makes Plans” or the “It’s a Plan” Stamp Set? We will choose ONE lucky winner for each stamp set! Comment on the NND blog and Design Team blogs (see list below)! The winner will be chosen at random from the collective reveal posts. Make sure to check out each of their blogs and comment for your chance to win. 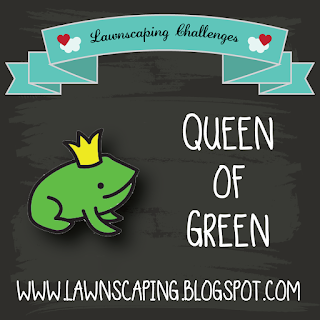 You will not know which blog has been chosen so the more you comment on the better your chances are of winning! You have until Thursday January 17th at 9pm EST to comment — winners will be announced on the blog post on Friday, January 18th. 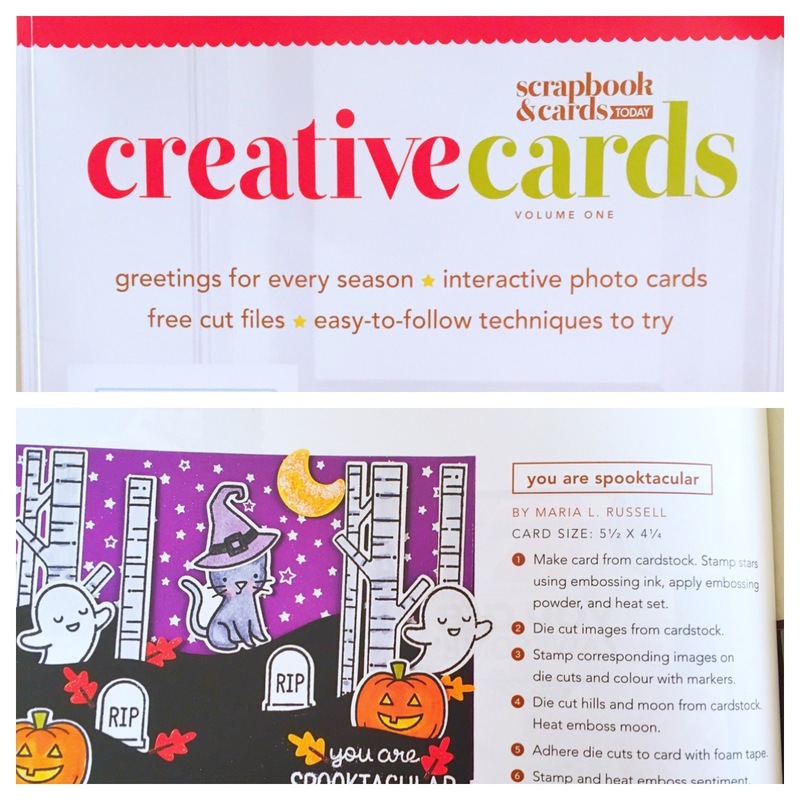 Hello my crafty friends! I hope you are having a fabulous week so far. I’m back today for Xyron and I have a cute project to show you, using the Creative Station Lite, with a double-sided laminate cartridge. I have always loved to decorate my planner. If my planner looks organized and beautiful, I get inspired to use it more. Write my thoughts down and update my schedule. As soon as I open my planner, I would like to see something inspiring, something beautiful. Most of the times the cover that you get when you purchase your planner is plain and boring ~ so I decided to create my own planner insert. I started out by cutting a Bristol Smooth white card stock measuring 4 ¼ by 6 ¾. I am using my favorite combination of distress oxide inks for galaxy backgrounds (i.e., fossilized amber, picked raspberry, wilted violet, broken china and black soot). Using my mini-ink blending tools, I started to sponge the fossilized amber in the middle, then blended the rest of the distress oxide colors onto my card stock. I used my distress sprayer to spray some water on my colored background to achieve the distress look, dabbing the excess water droplets with a paper towel. They look like stars in the sky! I stamped by images using a stamp set by Hero Arts onto my colored card stock with memento tuxedo black ink. To add the stars, I stamped them with versa mark ink and heat set it with white embossing powder. I also added the sentiment “We’re All Made of Stardust”. To finish the design, I added some gold star confetti. Using my Creative Station Lite with a double-sided laminate cartridge, I inserted my decorated planner insert through the machine, cranked the handle, and cut it through using the trimmer on the other side. Here’s what it looks like once it’s fully laminated. I really love that you can use laminate projects using this machine without having to use heat or electricity. I trimmed the excess with my scissors. I used my We R Memory Keepers Crop-A-Dile to punch the holes on my planner insert. Here’s what it looks like inside my travel planner. Isn’t it beautiful? I absolutely love creating my own planner inserts to decorate my planner. What do you guys think? I hope you like my project today. For more project inspiration using Xyron products, please visit the Xyron Facebook Group here (https://www.facebook.com/xyroninc/) or the website at www.xyron.com. 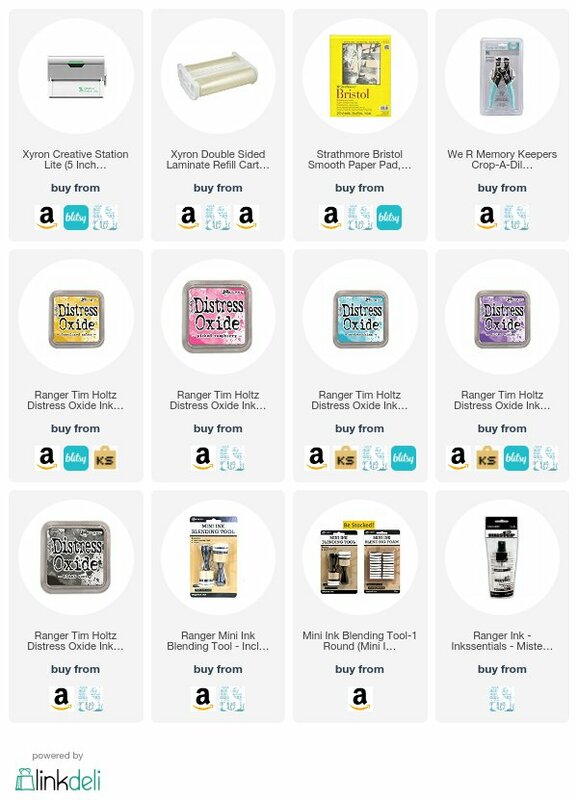 I have also listed and linked the supplies I used below. Have an amazing day! Click on the link to go directly to the product. Where available, I used compensated affiliate links which means if you make a purchase I receive a small commission at no extra cost to you. Thanks for your support. 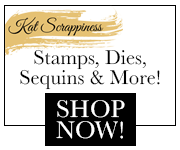 Hello stampers and crafters! Thank you for stopping by. Today is release day (Day 2) at Newton’s Nook Designs. If you haven’t checked out yesterday’s post, please do so to see the amazing projects created by our design team members. Please also check out our Instagram photos to get more inspiration. For my card below, I stamped my images on Neenah solar white card stock with my memento tuxedo black ink. I colored the images using my Copic markers (I opted for pastel colors), and die-cut my stamped images with its coordinating dies. To give my macaroons a little bit more detail, I used my liquid appliqué and heating tool to puff up the white liquid and make it look like icing. At this point, I decided to make this a shaker card. I used my 3M Scotch foam adhesive to adhere it on my card stock to create my window panel for the card. I wanted the macaroons to be the main focal point on this card so I created a white on white background, and used some clear sparkling sequins for my shaker element. I also used this stamp set for my planner layout this week. I really love stretching my stamps and using them to decorate my planner. I hope you like my card and my planner layout and somehow got inspired today. This Love & Chocolate stamp set and Love & Chocolate Dies will be available for purchase on January 20 at 8:00 a.m. CST. 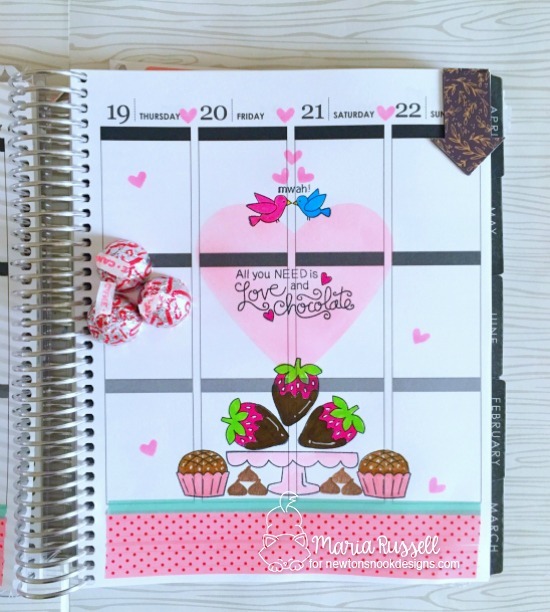 Would you like to win this “Love & Chocolate” stamp set? This stamp set will be given away to ONE (1) lucky winner! Comment on the NND blog and Design Team blogs (see list below)! The winner will be chosen at random from the collective reveal posts. Make sure to check out each of their blogs and comment for your chance to win. You will not know which blog has been chosen so the more you comment on the better your chances are of winning! 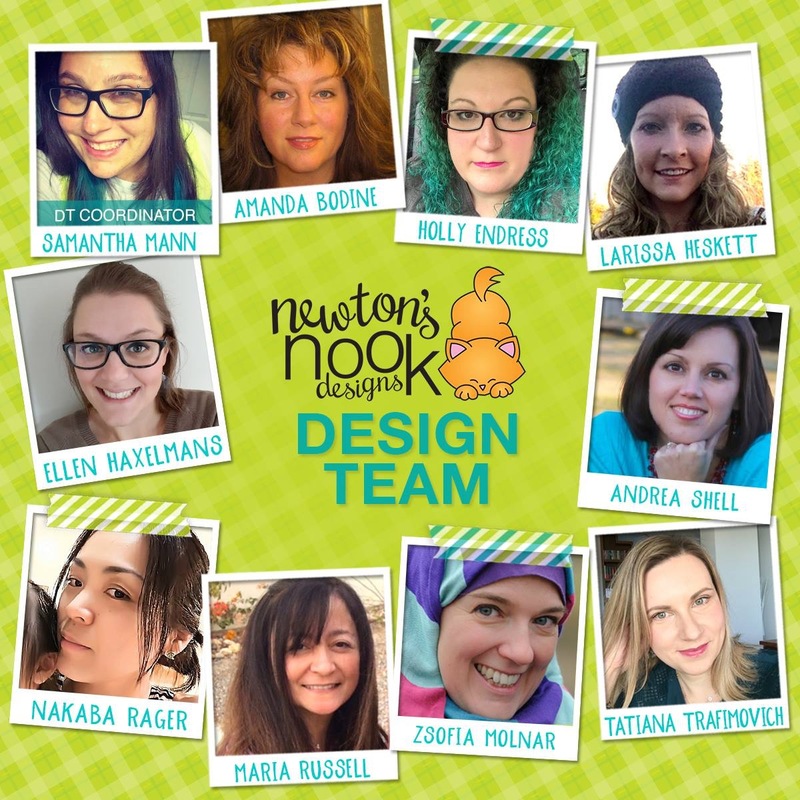 You have until Thursday January 19th at 9pm CST to comment — winners will be announced on the Newton’s Nook Designs blog post on Friday, January 20th. Today marks the launch of the new Food and Fitness Planner Stamp Set by www.jessicalynnoriginal.com. This is the fourth planner stamp set by JLOriginal. 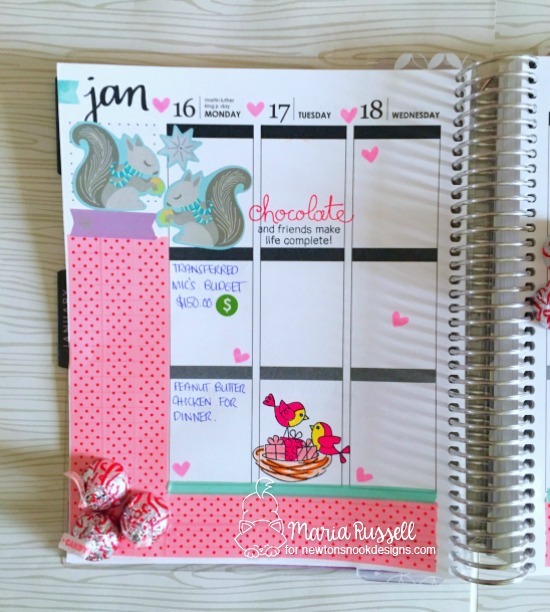 I love these planner stamps and I use them all the time on my Erin Condren Planner. Here is how I decorated my planner this week. I also used an older JLO Planner Stamp Set (which is one of my all-time favorite). Here is a card that I made using the bicycle and a digital stamp by JLO. This is a motivational card. Last but not the least, here are two fun shaker tags that I made using the cute veggies. I had so much fun creating this week. The stamps are now available for purchase at http://www.jessicalynnoriginal.com or through http://www.amazon.com. Please don’t forget to visit the other team member’s blog and leave a comment to be able to enter Jessica’s giveaway. Good luck and have an amazing weekend! I am married to an amazing man, Richard and we have two beautiful children (Dominic 30 and Jessica 22). I am an Interior Designer by trade, although I am now enjoying an "almost" retired life with my loving husband. I love to create beautiful things and also love to decorate my home. Crafting is my passion. I've always been a fan of DIY projects. Four years ago, I started paper crafting (i.e., card making and scrapbooking). In this Blog you will see a lot of crafting project inspiration - whether it's DIY decor for your home, or handmade cards, tags, planner and scrapbooking layouts. 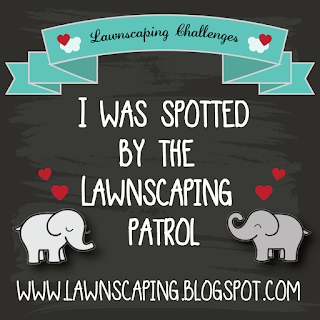 I would love it if you would stop by and check out recent and past posts. I hope that by doing so, I have inspired you to create beautiful things. Have an amazing day! All content of this blog including photos, tutorials, text, and design work are copyrighted under © Maria Russell Designs. All artwork is shared for your personal inspiration only and may not be copied for submission for publication, contests or design team applications. No part of this blog or blog content may be copied or changed without my express written permission. Thank you!